This is just one of many illustrated articles to be found in the author’s Astronomy Digest. Many of those who start out in astrophotography will use a DSLR camera. However, there may come a time when a beginner might consider a cooled CCD camera. Their great advantage lies in the word ‘cooled’ as, by reducing the sensor temperature to typically -20 Celcius, (and so perhaps 40 degrees below that of a DSLR sensor) the dark current made up of thermal electrons is reduced by a factor of more than 100 and its noise level by a factor of ~10. Images will thus contain far less noise and longer exposures are made possible as the greatly reduced dark current will not fill the pixel wells so quickly. A further advantage over an unmodified DSLR is that the sensitivity to the deep red H-alpha emission will be significantly greater. 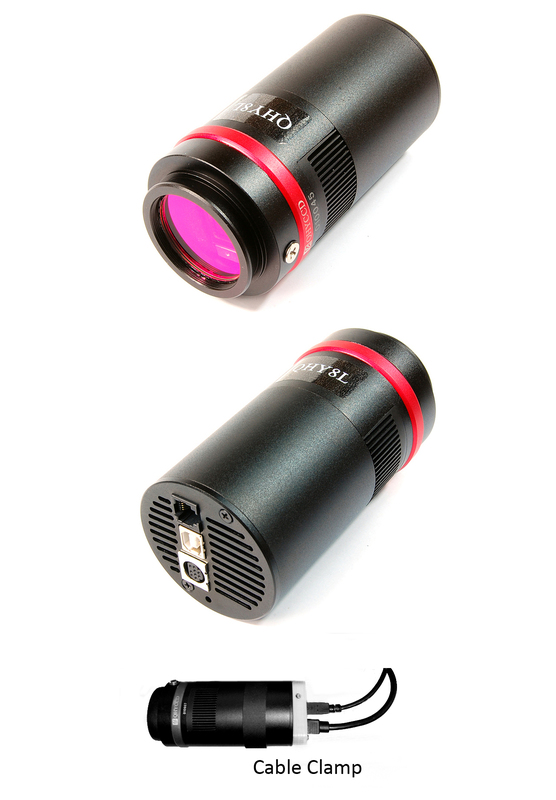 CCD cameras can use monochrome or colour sensors, the latter having a Bayer matrix of red, green and blue filters above each set of four pixels so that colour images are immediately captured. Many web discussions relate the relative merits of the two types but there is no doubt that a colour camera is simpler to use and will cost significantly less. Having perhaps been used to capturing images with a DSLR having an APSC sized sensor, one is unlikely to want a camera with a significantly smaller sensor. The lowest cost ‘One Shot Colour’ (OSC) camera currently on the market with an APSC sized sensor is the QHY QHY8L costing around £1,000 as shown below. (This is available from Modern Astronomy : http://www.modernastronomy.com/) The camera uses a 6 megapixel Sony sensor employing 7.8 micron square pixels and, most importantly, incorporates ‘set point cooling’ to cool the sensor to a specified temperature such as -20 Celcius. This makes the taking of dark frames at the same sensor temperature as the light frames far easier. The camera uses 16 bit digitisation and provides for 2*2 and 4*4 (monochrome only) binning modes. The 4*4 mode, which averages over 16 pixels, is significantly more sensitive and is used for rapid initial alignment on the selected object. The EZcap capture software provided allows a sequential set of exposures to be taken which must be un-binned (1*1) to allow for colour capture. Though these can be exported in the JPEG format, only 8 bits per colour will then be saved and in order to retain the full 16 bits of data per pixel, images must be saved using the FITS format. This is a raw file format which saves a 16 bit word for each pixel but contains no colour information. The software processing the data must thus be told the format of the colour filter matrix in order to ‘debayer’ the raw data to produce a colour image. When the set of FITS images to be aligned and stacked is loaded into Deep Sky Stacker, the ‘FITS Files’ section within the ‘Raw/FITS DPP settings’ window must be opened and the appropriate Bayer matrix employed by the sensor selected (‘GBRG’ in the case of the QHY8L). Deep Sky Stacker (http://deepskystacker.free.fr/) then appropriately debayers the monochrome images to give each colour a 16 bit depth in the output TIFF file. I imaged the Double Cluster using a 72mm William Optics Megrez, refractor having a focal length of 432mm which was used with a Teleskop Service 2-inch field flattener and Astronomic CLS light pollution filter. 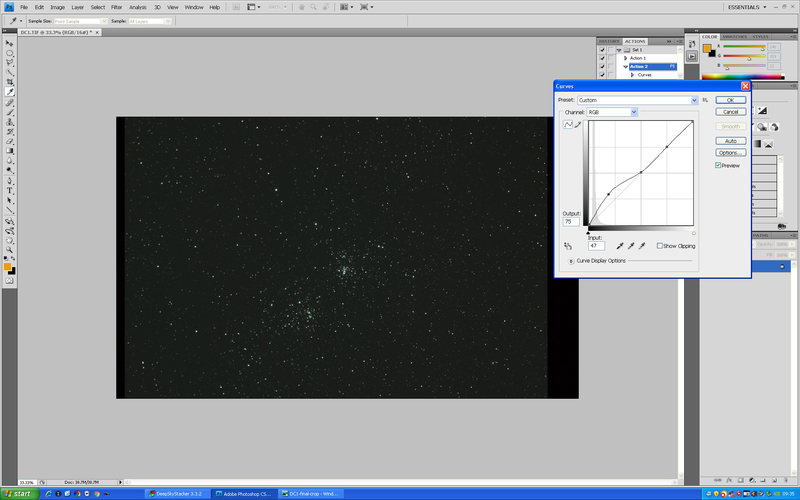 These two star clusters are relatively bright and so, if using a cooled colour camera, a total exposure time of ~30 minutes is sufficient. 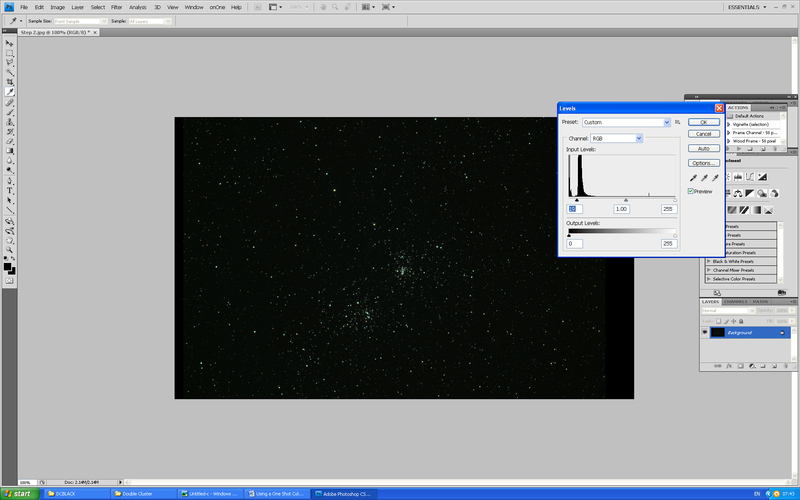 Using the QHY8L, the EZcap software was set to take 6, 6 minute, exposures to give a total exposure of 36 minutes. With exposures this long, it is necessary to autoguide the mount. This was achieved using an 80 mm achromat refractor guide scope and QHY6 guide camera with the mount control provided by the excellent PHD autoguide software − the tracking output from PHD guiding can just be seen to the right of the EZcap capture screen. EZcap screen showing the 360 second exposure time. The PHD guiding screen is partly shown to its right. It is always useful to view the individual images to check for any faults such as guiding errors and hence trailed stars. This can be done with the free program IRIS (http://www.astrosurf.com/buil/us/iris/iris.htm) which will produce a monochrome image when a FITS file is loaded. The set of FITS files were imported (with the appropriate GBRG debayer matrix selected) into Deep Sky Stacker for alignment and stacking along with a set of dark frames. These, taken with the same sensor temperature and exposure time, allow hot pixels and some amplifier glow in the extreme top left of the image to be removed. The Double Cluster can also be easily captured with a DSLR but then I would take short exposures (~30 seconds) to account for the higher dark current and increase the total exposure time to 60 minutes. 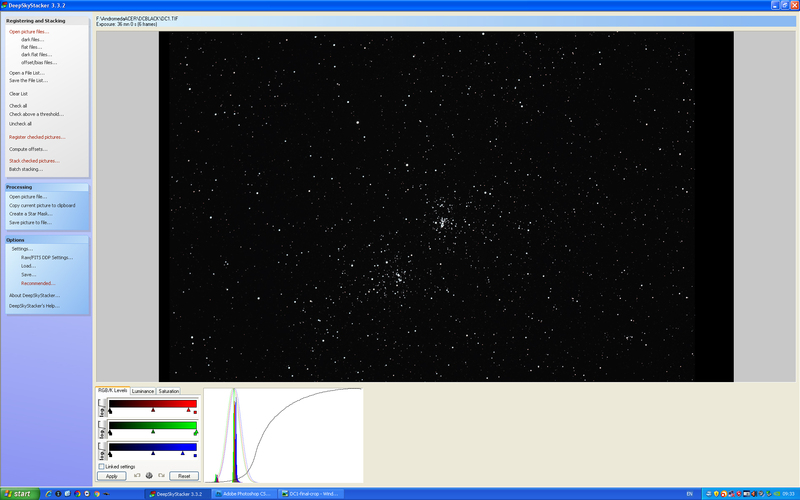 The figure below shows the output screen of Deep Sky Stacker having aligned and stacked the 6 images. Pleasingly, the three R,G,B histograms are well aligned showing that there was little light pollution in the image as a result of having used the Astronomic CLS light pollution filter. The resulting image was exported as a 16-bit TIFF file into Adobe Photoshop and stretched using 4 applications of the curves function as shown in the image below. This lifts the brightness of the fainter stars but not that of the brighter ones. To reduce the background noise in the image, the levels command was then used to bring up the black point as seen in the following image. 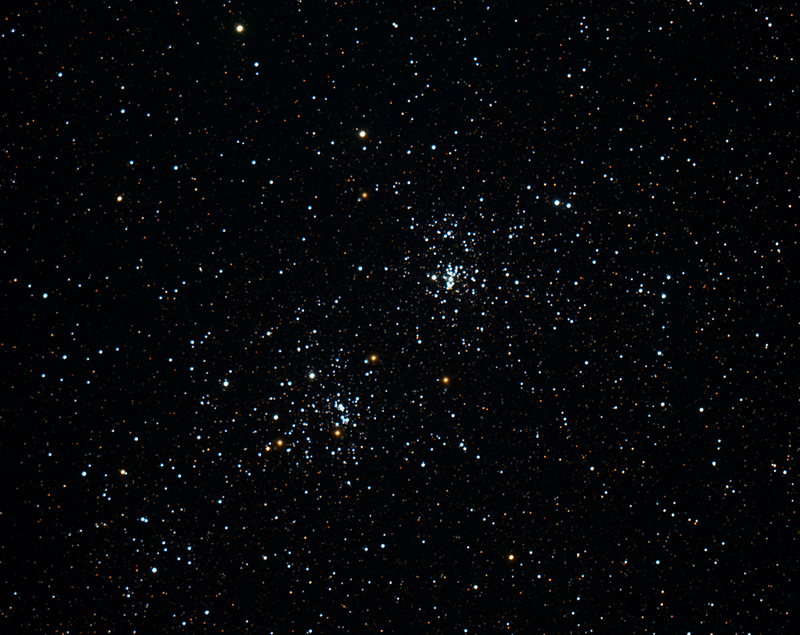 The final image of the Double Cluster was cropped to show the two clusters better. A number of red giant stars (which are actually orange) show up well. 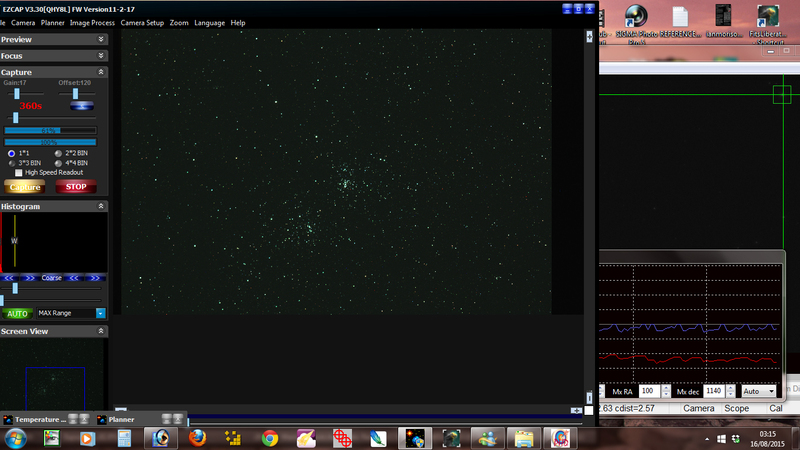 The Perseus Double Cluster imaged using a QHY8L colour CCD camera and William Optics 72mm Megrez refractor.